Can’t believe we are in year 5 of Teen Science Cafes already! The Whiteville node continues to grow and thrive as we strive to make more community partnerships to help our teens realize the potential for future employability in STEAM fields right here in Columbus County and the surrounding areas. Our local hospital system’s (CRHS: Columbus Regional Healthcare System) Foundation donated $2500 to our cause in February which helped fund the remaining Spring Cafes, two summer programs and a trip for the leadership group to Bald Head Island. July was busy for TSC Whiteville despite it being off-season for the program. 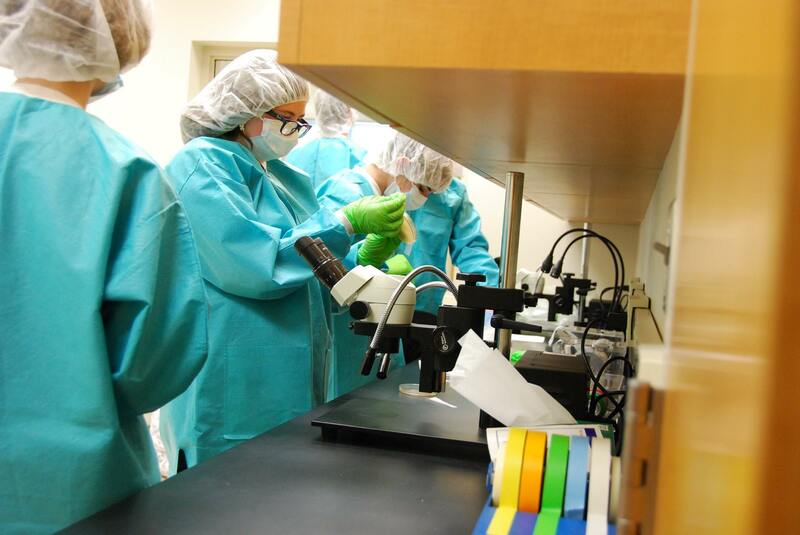 We took up the invitation from our April Cafe presenters, Kathryn Davenport and Teresa Lengner from Southeastern Community College (SCC), to visit the Education Lab at the College and perform a micropropagation experiment in their sterile lab environment as well as build a mushroom box. While we were there, one of the college counselors came and spoke to the teen participants about SCC and its programs and about general information regarding preparation for the college application process. 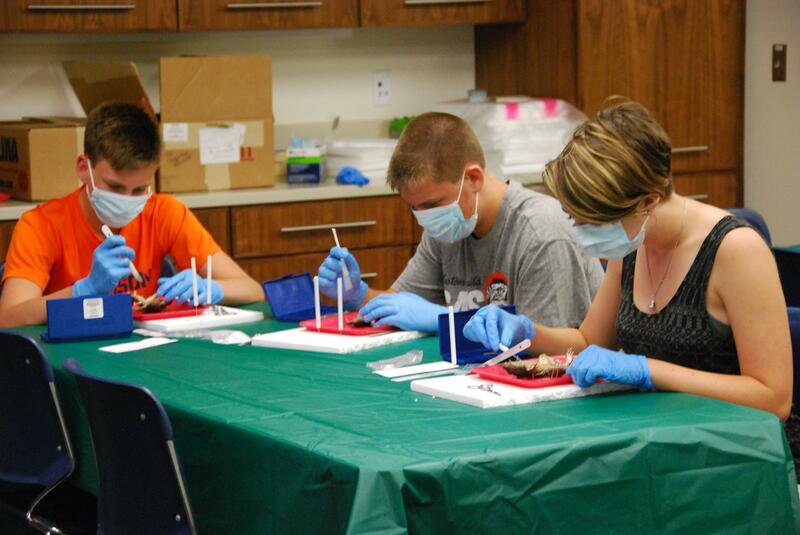 Our next adventure was Dissection Day! 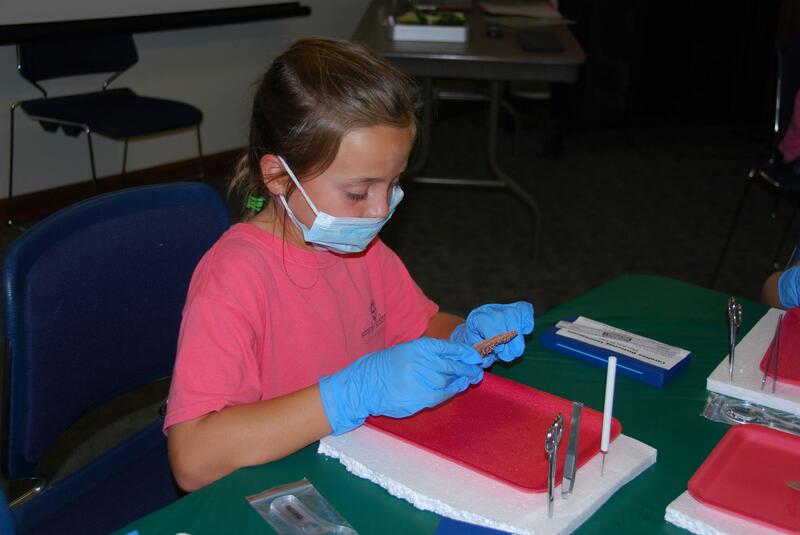 Teen leaders participated in and assisted with two dissection programs, made possible with ‘leftover’ funds from the original NSF grant. Frogs were dissected by middle-high school aged youth and starfish were dissected by elementary-middle school aged students. The room was full for both programs! As a bonding/thank you for your extra time activity for the Teen Leader group, thanks to the CRHS Foundation’s generous donation, the 7 leaders and I were able to enjoy an amazing day at Bald Head Island (BHI) Conservancy. Our day started in the wee hours so we could catch the early ferry to the island. An Island Nature Tour was first. We toured the beach, fresh water lookout, maritime forest and salt marsh all within the 12,000 acres of the island while riding on golf carts, as cars are not permitted on the island! We then met with Sarah Poulin, Coastal Specialist, who spoke to us about the Conservancy; what it is and what they do, highlighting their renowned sea turtle program. After lunch the teens were divided into groups and shadowed the Conservancy college interns. One group checked the tagged turtle nests, looking for signs of hatching, and helped build nest cages and tag nests that had just been laid. Another group helped collect water samples from different areas and then returned to the lab to filter the samples and collect data. The final group shadowed the education interns and assisted with the Touch Tank public program and returned to the fresh water lookout to help educate the public who were touring the island. Free time allowed us to revisit the beach where a kite was flown in the abundant wind, frisbee was played, and we enjoyed putting our feet in the warm waves of the ocean. Our final activity of the day was to observe the excavation of a sea turtle nest that had hatched 3 nights prior. Nest excavation serves two purposes: to take an inventory of the nest, and to release any “stragglers” that may still be in the egg chamber. An inventory is taken so that they can determine success rates of the mothers. This is by counting the number of empty eggshells found and comparing it to the number of unhatched eggs. Sometimes, there are still live hatchlings in the nest, which are then released on the beach so they can make it to the ocean. This past season alone, BHI was host to 102 loggerhead nests!!! The nest we observed the excavation of still held 17 hatchlings that were unable to climb from the chamber. What a wonderful experience it was to watch them as they were placed on the beach and made their way to ocean!!!! The ferry ride back to the car was quiet as we watched the sun set and thought back to our amazing adventures that day on BHI! To see pictures of our day go to our FB album at: https://www.facebook.com/media/set/?set=a.1543346565682826.1073741843.628643337153158&type=1&l=28f75c3c4b. September started our new Cafe season with Science Trivia that the leader team put together and presented. Not only did we have trivia questions, but did experiments/had demonstrations to back up what the questions were asking! The teen leaders helped participants make slime, and catapults, and one leader led a physics demo about Newton’s Laws! Our trip to one of the local corn mazes, Maze Craze, in October was so much fun! We were fortunate that the maze somehow survived the wrath of hurricane Matthew who hit our area only weeks before. 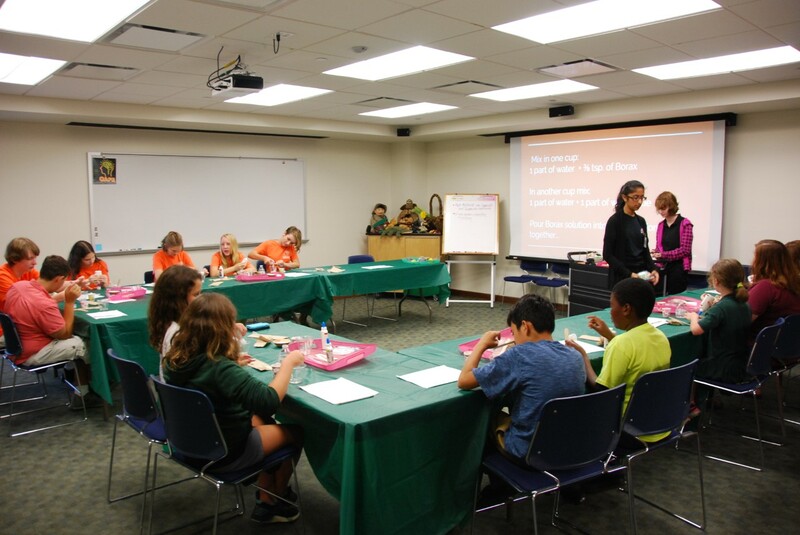 The teen group also led a slime making activity at our museum’s Spooktacular Saturday celebration on Halloween. They were the hit of the day!!! 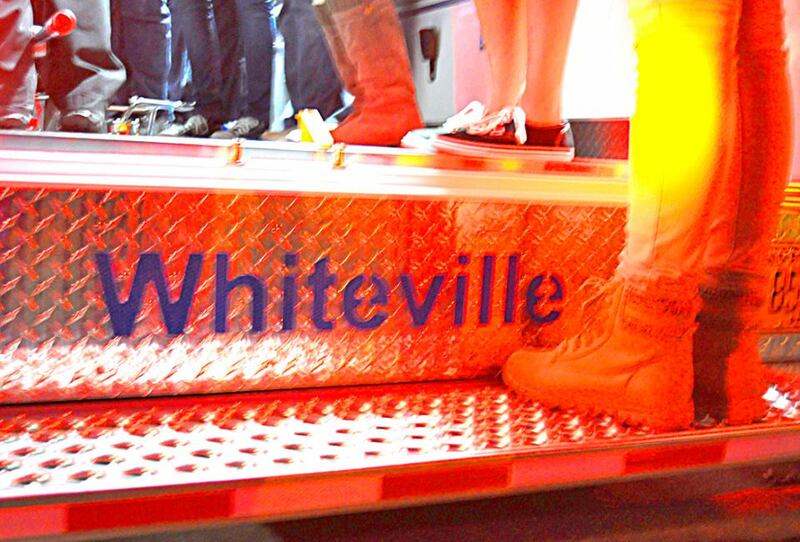 As our Whiteville program continues to try to expose our community teens to a variety of STEAM topics we reached out to our local paramedic unit who brought one of their ambulances and took us through a tour of it and all of its many compartments as well as demonstrating some common scenarios. This was all done primarily by two of the unit’s Jr. Volunteers who are high school students who ride along with and assist the first responders in all that they do! Through this Cafe we are now in contact with our local airlift/helipad copter program trying to set a date for a tour of their helicopter and to learn more about their important role in our community’s welfare, as well as trying to set up a CPR class as a special Cafe program! To close out 2016 we will be visiting CRHS’ Imaging Department learning about and seeing first hand the various modes of imaging that play such a vital role in diagnosing patients. We will also hear about the many different levels of jobs that are needed to keep this one department of the hospital running smoothly and effectively. 2017 is knocking at the door and holds so many more wonderful opportunities and adventures for our Teen Science Cafe Whiteville program!